Are you a gentlemen that holds the door for people? If so then you maybe a true superhero. On this t-shirt is simply says “Not All Heroes Wear Comes Come Just Hold The Door” so that means hold the door and people think of you as their hero. The whole design of the print has a worn look as if you are wearing it for many years. 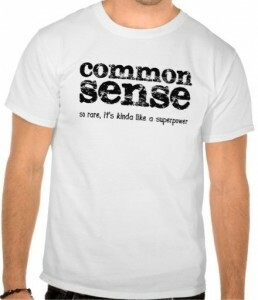 And you can get this t-shirt in many cool colors and in men’s sizes Small – 3XL. 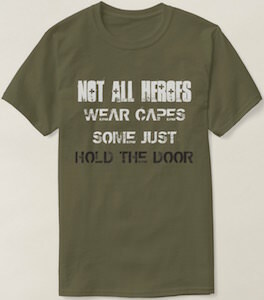 And you may not get a cape for holding the door but this t-shirt is made from 100% cotton to be super comfortable. This t-shirt is for all the supporters of Donald Trump. If you want him to become the next president of the United States then this is the shirt to wear and support him in. 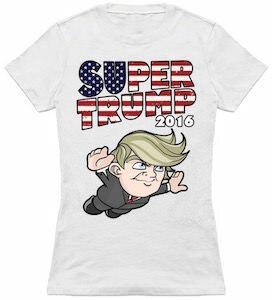 On the t-shirt you can see Donald Trump and it seems like he is flying and above the image of Trump it says “Super Trump 2016” and the font has a design like the Stars And Stripes flag of the USA. You can get this Donald Trump t-shirt in many colors and in styles for both men and women. Made from 100% cotton this Super Trump shirt will feel great so now you just have to pick a sizes between Small – 6XL and you are ready to get the word out. Now you can surprise you awesome dad with a great t-shirt. This is a ringer t-shirt that is white with black edges on the sleeves and neckline. On the white shirt you can see two hands that open a dress shirt and under it you can see you blue superhero costume that has a red star on it and the words “Super Dad”. Just imagine how happy your dad will be with this amazing looking shirt that shows how much you love him. 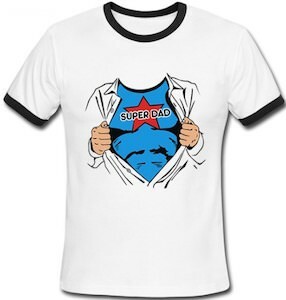 This super dad t-shirt is made from 100% organic cotton and is available in sizes Small – 2XL. Get your father a super present like this Super Dad Ringer T-Shirt. Lab safety is no joking matter, I’m not sure if you messed with the chemicals you will turn into a superhero but hey it’s a great thought. On the front of this t-shirt you will find a saying that may not keep you in the lab but is something everyone wants to say. Find the quote “Screw Your Lab Safety I Want Superpowers” along with a beaker full of red liquid. This t-shirt is made to be durable and very comfortable as it is made from 100% cotton, it is available in a huge variety of sizes that range from Small to 4XL and you have a choice between 8 different vibrant colors. 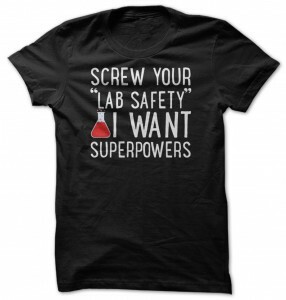 Be a rebel with the Screw Your Lab Safety I Want Superpowers T-Shirt. Is you dad the best dad in the whole world? Then he probably is like a superhero and that is why you should get him this t-shirt as a fathers day or maybe birthday present. 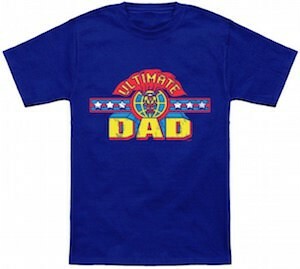 The t-shirt comes in a bunch of fun colors and even in black and on the shirt you can see a superhero in the middle with stars besides him and above it you find the word “Ultimate” and below it there it says “DAD” because this t-shirt is for the ultimate dad in your life. 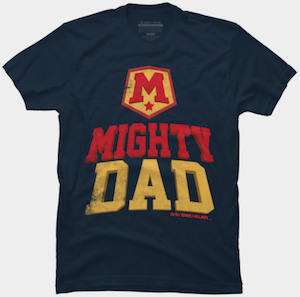 You can get this superhero dad t-shirt in sizes Small – 6XL so that you get the size you hero fits. Come take a much closer look at this Ultimate Dad Superhero T-Shirt. Send an inspiring message by wearing it. On this t-shirt you can get the saying “Be your Own Hero” on the front or back, this saying is done with some fancy designs to make it stand out and help make your point. Available in a wide selection of sizes that range from Small to 3XL and a huge choice of colors 18 different in total, put the print on the front or back and it will be very comfortable and super durable as it is made from 100% cotton. There are so many other styles of shirts to check out aswell from hoodies, women’s fitted, unisex organic and more. 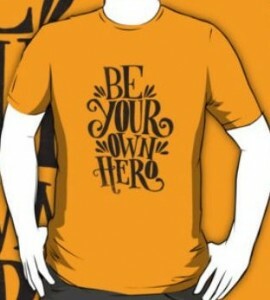 Get your message seen by wearing the Be Your Own Hero Inspiring Message T-Shirt. Being a mom is a full time year round job, some may say that it could be a job title and that a superhero has nothing on mom. 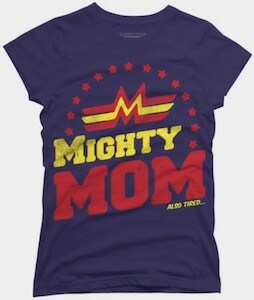 On this t-shirt you will find the fun and true saying “Mom Because Superhero Isnt An Official Job Title”, using large pink lettering for “Mom” and “Superhero” while the rest is large black lettering. You can this print on the front or back of the shirt and choose from 18 different vibrant colors, it is available in a variety of women’s fitted sizes that range from Small to 2XL and it will be both durable and comfortable as it is made from 100% cotton. Also check out all of the different styles of shirts you can get this mom print on from hoodies to organic. 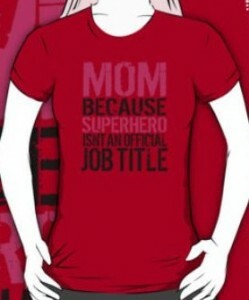 Be a true hero and wear this Mom Because Superhero Isnt An Official Job Title T-Shirt.